Fortean Times recently published an article unveiling the identity of a South African cryptid I haven’t thought about in years. 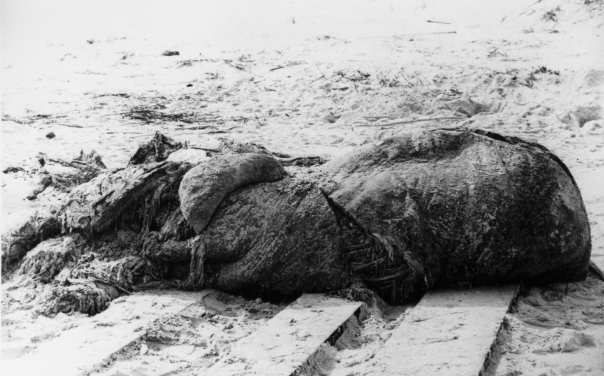 Trunko was a sea monster described by witnesses as covered in snowy white fur and possessing a long, perhaps elephant-like nose, seen doing battle with two whales off the coast of Margate, South Africa, in 1922…or 1924, depending which account you read. The creature’s carcass washed up on shore shortly after, possessing no discernible facial features and no noticeable limbs. Some accounts also state the creature had no blood, despite the recent and violent battle. Ten days later, Trunko vanished back into the sea, washed away by the tide or under its own power, depending which version you go by. In the article, You’ve Been Trunkoed, Dr Karl Shuker works through the variations on the Trunko story, the details which help or confuse the facts, and at last, with the discovery of actual photos of the beached carcass, unveils the true identity of the lesser known sea monster. Cryptid fans and folklore enthusiasts, go read it, it’s a great article and a lovely look at how truth can be dug from those old first-hand accounts, even long after evidence has vanished. Then come back here, of course! Gore-gawkers and curiosity seekers, you can stick around, because I have pictures. Tons and tons of pictures. What on earth are all these beached creatures? Globsters. Blobs of organic matter from dead sea creatures, washed up on the shore by the tide. In many cases, they’re blubber from whales, which floats to the surface after separating from the skull and other major bones. Globsters may still have one or two bones in them, and are often covered with fine ‘hairs’ — exposed connective tissue fibres. As for how something like this could be seen doing battle with two whales? Just search “orcas playing with food” on youtube sometime. I don’t know about you, but personally, having an explanation for these eerie masses does absolutely nothing to diminish the flail-scream-panic response in me. If I found something like this on the beach I’d still expect it to writhe, rise up, and lash at me, to absorb me into its invertebrate mass and revitalize itself upon my bodily fluids. it came from beneath the deep!